The wine of Santorini is truly unique. There are several reasons that have to do with the local conditions, the absence of water, the strong winds and the volcanic soil of the island. The most important reason however is something really few know about Santorinean wine. Santorini is like Noah's Ark when it comes to vine varieties. It is the only place were ancient Greek varieties live on! During the end of 19th and the beginning of the 20th century most of the vineyards of Europe were hit by Philoxera. Philoxera is a voracious vine devouring insect, originally from North America that has always lived together with American vines without causing any injures. Around 1850 infected vines carrying the insect were brought to Europe, in France in the beginning. The Philoxera insect began to spread out first in France and then Spain, Italy, etc and its devastating epidemic attack destroyed vines not only in Europe but in the rest of the world. It was the biggest damage in agriculture known so far. All the vineyards of Europe were hit and they simply perished. The vines you see in most of Europe today were grafted from vines imported from America. All the European varieties disappeared! Well to be exact not all! Santorini escaped this disaster! Due to the volcanic soil of Santorini, the pumice stone and the sulphides it contains the philoxera bug does not survive here. Bugs need clay. Santorini soil is mostly a mix of pumice stone, flint, iron and stone. 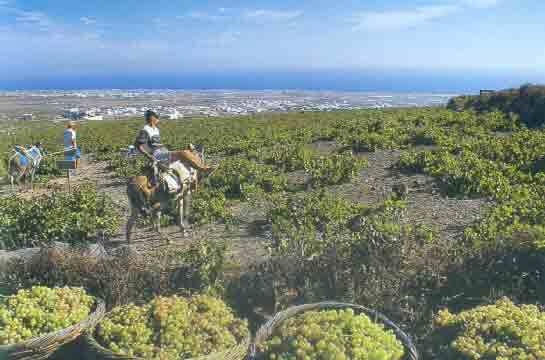 In Santorini the original Greek vines, like the Assyrtiko variety, Mandilaria, Aidani and about twenty more lived on. So in Santorini even today we have the unique opportunity to taste the ancient Greek vines. It is a huge treasure known only to few. The volcanic soil of Santorini and the pumice stone serves also as a water tank for the vines. Santorini is and was always sort on water. Pumice stone soaks up the night moisture likes a sponge and returns it to the plants during the day. This is kind of a natural irrigation! Nevertheless the fertile soil - due to the volcano - gives a special identity to the grapes and to the wine produced by them. Wine has a long history on Santorini. Numerous artifacts found in Akrotiri archaeological site suggest that wine making has been going on in Santorini for more than 4000 years in spite of some quite adverse conditions. Apart from having hardly any water, the island is very windy. Kouloures is the answer to the wind. It is a technique where vines grow low on the ground, trailing them in circles (this is what Kouloures means in Greek), so that the vine forms something like a round basket, inside which the plant and the grapes are protected from the strong winds. While pruning is thus very intense, the roots themselves have long lives. It is common to have 200 year old roots on the island and in some cases as much as 400 years old. The combination of old roots and the shock of the plant in order to find the water it needs is what gives the grape's flavor and makes wine of Santorini so strong and tasty. The wine is made in the traditional way . During August the visitor may participate in the wine making. The local producers will allow him to consume as much wine as he wishes, for free. The wine is stored in - kanaves - (cellars). Many kanaves are in Mesa and Exo Gonia villages.